Time to buy a lottery ticket... This is great! 47 (MG/Citron/Alfa/Volvo), 45 (Opel/Audi/Mazda/Saab), 48(Cooper/Lancia/Cheeta/Austin Healy/TR3/Auston Martin), 48(Lamborghini/Maserati/Suzuki), 40(Saleen/Lotus), 30(Duesenberg/Manx/Study), 222 VW, 28Toy Race Cars, 293 Corvettes, 129 Rear Engine cars, 98 Murcurys, 99 Willys brands, 64 Toyotas, 119 Shelby Cobras, 149 2 Door Cars, 53 Modern cars, 41 Trucks, 45 Hummer/suv's, 79 Road Race Cars, 921 Fords, 151 Plymouths, 241 Pontaics, 122 Cadillacs, 38 Lincolns, 76 Chryslers, 51 Oldsmobiles, 92 Buicks, 32 AMC's, 609 Chevys, 42 Jeeps, 109 Ferraris and Nash, 87 Porches, 36 Hondas 120 Salt Flat Cars, 185 Open Cars, 88 Mercedes/BMW, 211 Dodges, 44 Jaguars and nearly 700 other models of various makes and few packaged that represent the different makers. "An elderly impulsive, enthusiastic, and very knowledgeable gentleman started this collection many years ago" (I want to be described that way someday!) "Recently, his wife gave him the ultimatum to get them out of 'her' garage." The cars were donated to the Murphy Auto Museum, but the curator has realized that the "execution, space, money for display cases, and time for set-up " was overwhelming, so the museum is selling the collection. This collection really does belong in a museum (or my living room). 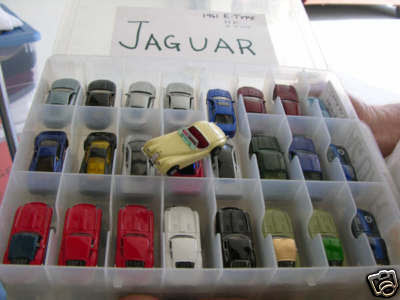 The seller points out that someone could make some money selling these cars separately - and that's probably what will happen - but it would be great if the collection could be kept together for all the world (or at least, me) to see. If I win the lottery today you'll all be invited over to my house to see this collection. Click here to see this eBay listing. Aren't most of these toast since real collectors want the cars in original packaging? Probably. For someone like me though, it's just cool to have the cars. I find most of mine at tag-sales and places like that. The ones I buy new I take out of the package and put on a shelf I had made. I guess it depends on whether one wants the cars for an investment or "just to have". I would be happy to display these as they are my modest collection of 80 or so range from 3 or 4 mint through to 60 or 70 good condition and a few well played with. I spend hours just looking at them and BECAUSE they aren't worth much I can enjoy them for what they are.